The booster from Leventi, the revolution in high speed cooking, offering all the benefits of combi-steam cooking, but in a fraction of the time. Imagine the benefits in a busy kitchen of being able to roast 20 x 1kg chickens in only 12 minutes, and yet retain all the moisture and texture you would find in a combi-steamer. By use of worldwide patented technology, Leventi have successfully combined combi-steam cooking with microwave technology. The results are truly impressive. Where speed is of the essence, The Booster will come to the rescue, and where space is a problem, a 3 tray oven can replace a much large combi-steamer. 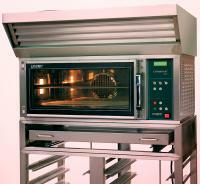 Leventi have been building top quality ovens for over 25 years. Since the very behinning a very solid oven has been combined with the latest cooking and baking techniques. The Junior is "Junior" only in its unique compact size (2 grids) as all special features of the rest of the Leventi oven family can also be experienced in the Junior. 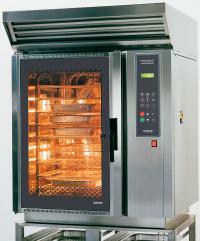 Not only is its excellent price quality ratio, but also the flexibility, user friendly operation and high cooking efficiency are proof that the Junior oven is a powerful and reliable partner in your business, as used by bakeries, supermarkets, kitchens and catering organisations throughout Europe. 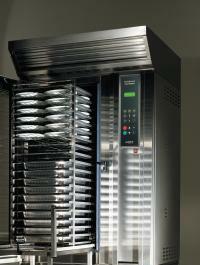 Modular in design the Leventi Junior ovens cane be stacked three high using just 1m². It can also be wall hung with support brackets, making it ideal for outlets with limited space and enabling efficient use of expensive space. "Easy to work with and controlling the operating costs" were the top priority when Leventi started developing the new 'Combimat 4' ovens. Depending on the personal preference of the chef, availability of other appliances and type of usage (Restaurant, Foodservice catering, Banquetting, Food Retail, or Mass Production), you can chose from two versions - Digital or Mastermind. Both operated by a menu controlled computer. For the creative chef to prepare his signature dishes or if you need or prefer a combisteamer to work in a simple manner. Select core temperature or time - select temperature - select humidity level - press start. The Combimat Digital will do the rest with extreme precision and always achieving a perfect result. When preparing large charges, you simply set the Combimat Digital in the continuous cooking cycle and by using the Cooking Alarms you can prepare various products at the same time. The Combimat Digital warns you when the products are ready. The automatic Working Steam Dosing system works at lower temperatures, thanks to the oven's intelligent settings this enables you to work and profit easily by working with complex and skilful recipe applications. For when you need to prepare perfect dishes repetitively or to serve a large variety of menu items without wanting to oversee the preparation all the time. Simply select the recipe from the 200 programmes and go. You do not have to worry about control and correction of the preparation after a single touch of a button. Operating the Mastermind is as easy and simple as withdrawing money from an ATM. Blind tests with inexperienced users who have never operated a combisteamer before showed that starting the correct programmes was easy. With the "Easy Programming Software" the Combimat Mastermind allows the user the ability to easily personalise, set, adjust and store / delete up to 200 recipe / menu preparation programmes. The Combimat Mastermind is an entirely automatic combisteamer for which the operating is simple and intuitive. The display (with adjustable clarity) will guide you without detours through the menus. Just follow the screen menu options and the steamer carrier out your choices literally. The Leventi Combimat Mastermind is the first combisteamer in the world to be equipped with RFID Easy Programming Software. This new technology enables the upload and download of programmes in a matter of seconds. Through the use of the RFID you can easily store and quickly transfer programmes vis PROtag to multiple ovens or sites by simply swiping the PROtag. Just imagine the possibilities - complex recipes requiring high level of skill, seasonal changes in menus, new menu items, menu changes to meet demand etc. - all easily and swiftly transferred from base to site or site to site, reducing menu developmental and implementation time, increasing operational efficiency and profitability. 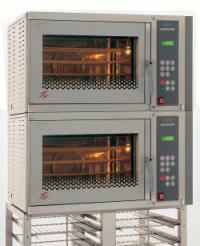 In addition to be simple to use, the Leventi Combimat ovens are designed for intensive and continuous use. By the use of high quality raw materials and components and a rigorous quality control process throughout the manufacturing cycle from design to assembly and pre-delivery test, enables Leventi to be the only manufacturer to offer an optional 5 year factory warranty on construction and mechanical & electronic parts. Hygienic rounded corners free of dirt traps and easily removable inner racks to ensure easy cleaning - Double insulated oven chamber that reduces heat loss and ensures lower energy consumption - Optional cavity dimensions allowing use of Euronorm, Gastronorm or Combinorm racking - Easy to stack (duplo) by clever design and placement of connections and drain - Easily accessible connection for decalcifying the boiler - The large tray distance of 75 to 95mm contributes to a perfect airflow. The electronics are secluded and easy to access for service and are protected by temperature sensors and forced filtered air flow. The robust door of the Combimat is reversible and has dual Action handle. The window with double glass insulated and hardened safety glass is covered on both sides with an infrared reflected coating. This reduces loss of heat and saves energy while created a pleasant work environment. The door is fitted with an integrated drain gutter which collects condense water and guides it to the draining system avoiding spillage on the floor when the door is opened. The door seals are easily replaced by the user. The new hinge construction ensures that the door will not swing open uncontrolled and is fitted with magnetic service free contact switch. 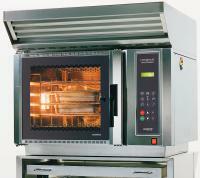 The Leventi Combimat ovens have a fully automatic cleaning system. Just start the cleaning programme and walk away to others tasks. Thorough cleaning - effective rinsing - The cleaning programme automatically mixes and injects the powerful detergent on the fan that ensures distribution in the oven chamber to clean it of fat, protein and residue thoroughly. The automatic rinse aid neutralises the oven and helps wash away the residue. The amount of automatic dosed fluid is related to the cleaning programme of the Combimat. 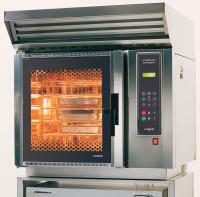 Safe - The Suma Auto Oven System is a closed system ensuring use by and change of the SafePacks by any member of staff without dripping or spilling the liquid. Environmentally friendly - By using the Suma Auto Oven System the waste of plastic bottles and sprayers is brought back by 75%. The materials used in the SafePack are reusable. Simple installation - The installation of the Suma Auto Oven System is simple. The SafePacks can be placed in a suitable location of under the Combimat. With a weight of 10kg per pack they are easy to handle. Economical - After the installation you need not worry any longer about the necessary cleaning of the oven as the system automatically signals you the SafePack should be changed for a new one. By using the Suma Auto Oven System you will also enjoy the additional benefit of a regularly changed and thoroughly clean oven which helps prolong the lifespan of the oven. Depreciation - Depends on how well you handle the oven, due to the strong build quality the Combimat enjoys an etended useful life compared to other ovens. Electricity Costs - Due to the double insulation (40mm), the oven body, which is closed on five sides and double glazed door with infrared reflecting coating, the Combimat uses less than 50% of it's connection value. Air Turn System (ATS) and a Dynamic Air System for a well divided warmth control in your oven chamber. Duplo stacking options available for maximum flexibility using only 1 meter of floor space.